875 North Michigan Avenue is a 100-story, Class A multi-use building, recognized around the world for its distinctive architecture, prestigious location and presence on Chicago's skyline. For these reasons, the building is sought after by both large and small office Tenants. 875 North Michigan Avenue offers its Tenants first-class amenities including on-site business services, parking, dining and retail. 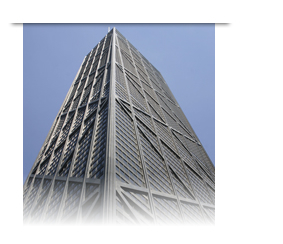 Designed by renowned architects Skidmore, Owings & Merrill, 875 North Michigan Avenue has won numerous awards for its innovative and iconic style, including the Distinguished Architects 25-Year Award from the American Institute of Architects. The building's distinctive exterior cross-bracing eliminates the need for support beams, greatly increasing the amount of usable floor space. 875 North Michigan Avenue’s interior incorporates rich travertine and marble surfaces with textured limestone. The elliptical-shaped outdoor plaza has become a favorite meeting place for North Michigan Avenue office workers, shoppers and tourists. This community oasis is enlivened with plantings, a 12-foot waterfall and seasonal outdoor dining and music.